So, now talk about the Andrew James Food Dehydrator! This food dehydrator helps you in cooking the healthy and natural appetizers in a fast and easy way. The snacks like fruit rolls ups, banana chips, beef jerky, fruit leathers, etc. can be quickly cooked in this machine. With the help of the drying process, it allows you to retain all the essential nutrients and natural flavor of the food inside them. 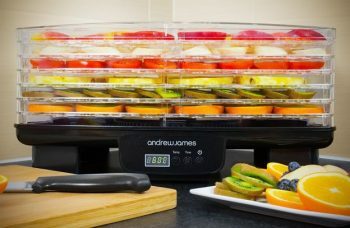 The Andrew James Food Dehydrator is a six trays dryer machine which has a higher air circulation speed that allows you to dry your food uniformly. There is no need of shelves rotation in the dryer also. The quality of the trays is also very high that let you dehydrate the food which is bulky in size. This machine can dry a vast variety of vegetables and fruits evenly. If you cut the food into the even size, then they will dry in the similar time quickly. It also comes﻿ ﻿with the adjustable thermostat feature and the digital timer that also benefit in the efficient drying of the food. The lid of the machine is transparent so that you can check the progress between the drying process quickly. If you want to know more about this product in detail then, just read the below review of the Andrew James food dehydrator that has written after doing in-depth study and research. We hope that the below review will help you in knowing this dryer machine much better so that you can consider it for buying quickly. What Comes with the Andrew James Food Dehydrator? The Andrew James Food Dehydrator is very easy to clean as well as to maintain. You do not have to make much effort for cleaning this appliance. It forms from the plastic material which is highly durable to withstand any cleaning. The trays can remove from the dryer for effortless cleaning. The air circulated very fast and in an efficient manner so that all the food on the trays dries out evenly without any issue. You can dehydrate any food in the machine, i.e., herbs and spices or hard foods like jerky and meat. This machine has an adjustable thermostat features which range between 40 degrees C to 70 degrees C. With the help of this feature; you can dry out the different type of foods in one single time without any problem. The range of temperature is sufficient to dry out high moisture containing fruit as well as jerky sticks. It mainly certifies that the temperature stays within the chosen limit. 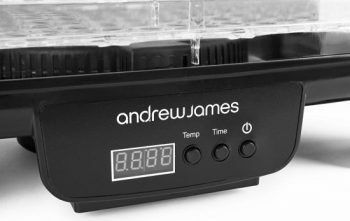 The Andrew James Food Dehydrator comes with 48 hours timer that you can adjust according to the time required by your food for drying. The machine will get automatically shut down when the timer gets up. It is a handy feature if you want to keep the machine ON during the nighttime without over drying the food. The Andrew James Food Dehydrator consumes very less power while drying the food. It has the power capacity of 550 watts which results in the electricity consumption of 3p in one hour only. It means you can dehydrate your food for the longest period without thinking much about your monthly electricity bills. The small power capacity does not mean that it results in slow drying. In fact, it is so much overpowering that it dries the meat in a few hours. The six trays of the food dehydrator are just impeccable for dehydrating all varieties of foods. You can put the fruits, vegetables, and jerky over them for drying. 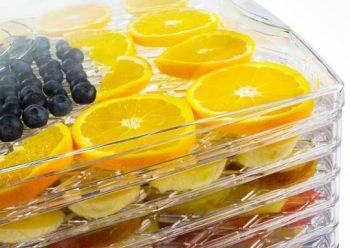 The trays have enough capacity to hold the food in bulk quantities. 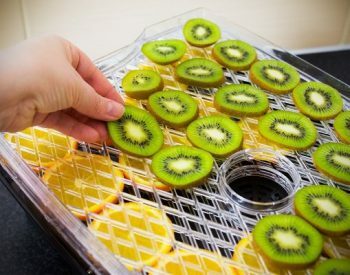 If you want to expand the drying space of the machine, then you may buy the additional trays from the market. The trays are also phthalate-free which allow you to make healthy food. The appliance comes with the adjustable tray stacking system. It means that you can stack the trays on two different heights anytime to quickly place the food of various sizes, thickness, and dimensions. It is one of the best features of the machine which usually not found in other food dehydrators. The machine has also got approval from the ROHS (Restriction of Hazardous Substances) and CE (Conformité Européene). It means this product easily used without the fear of any danger or safety. It has also got certification to get sold in Europe. It comes with the manual book also which gives all the necessary instructions and guidelines that required for running the appliance efficiently. If you use the machine as per the guidebook then, it will serve you for the longest period without any problem. In the manual book, you get time for drying and the ways to make dry food delicious also. The very first thing which you will undoubtedly notice about the Andrew James food dehydrator is that it comes in the rectangular shape. The rectangular shape food dryer has more capacity to hold the food than the round shape food dryers. It means this dryer has more drying space for cooking dried snacks than any other model which you find on the market. It has a adequate capacity for drying as per the cost of which the food dehydrator offered. If you look at the similar price range products then, you will find that there will be no dryer which is giving you the same drying space on such cost. 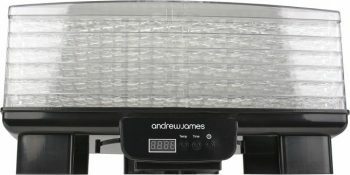 The look of the Andrew James food dehydrator is exquisite. It makes your kitchen look more elegant and beautiful when you place it there on the countertop. In comparison to the cheap plastic food dryer, this machine seems robust and sturdy in the appearances. The Andrew James Food Dehydrator comes with six shelves, but you can add more trays to increase the dehydrating space of the machine. It has a digital adjustable thermostat which comprises of the drying temperatures range of 40 degrees C to 70 degrees C. You can set the range according to the type of dried food you want to dehydrate in it. A 48 hours digital timer is also given on the food dehydrator which you can adjust consequently. As soon as the timer gets up, the machine will also get shout down immediately. It is a stackable food dehydrator model in which the fan situated at the bottom section of the unit. The air flows vertically, i.e., from bottom to the top in this appliance which makes your food dry out thoroughly from all sides. The bottom-mounted fan along with the heating element located at the base of the unit. It delivers a consistent air flow for perfect drying. There is no need of trays rotation during the process of drying also. The dimensions of the Andrew James Food Dehydrator are 28 x 28 x 43 cm. You can place it safely on your kitchen countertop. The total weight of the machine is 4 Kg. It means you can carry and move it quickly from one place to another. The kind of material which used in manufacturing the appliance which is plastic phthalate-free which allow you to make the healthy food. The maximum power capacity which is utilized by the food dehydrator is 550 watts which are quite enough to dry out the food like jerky, meat, etc. It runs of the 230 v which is also quite good power. The manufacturer of the product provides the limited warranty period of two years along with the appliance to their buyers. The width of the wire in the food dehydrator is 1.10 m. It is quite long to move the machine in your kitchen. The food dehydrator complemented with an instruction manual which gives you a detailed explanation that how can you use the appliance in a better way. It also describes the safety precautions which you can follow while using the machine. It tells you the drying time which the food will take. The manufacturer of the product offers a 2-year warranty period from the date of buying. So, in the case of any defect or problem the company will replace the product, but after the end of the warranty period, the company will not entertain any issues without any expenses which you have to bear. You get six trays along with the Andrew James Food Dehydrator for drying the food. The capacity of the trays is quite enough for drying food in bulk. But if you want to increase the drying space more then, you can buy more trays from the manufacturer. Knowing the best things about the product which we are buying allows us to compare it with the other available options easily. It tells you that how the product is more beneficial than the other similar models. The six trays of the food dryer are enough for drying food for a small family. However, in the case of any big party, you may increase the size of the machine by adding more trays which are very helpful. You can remove and insert the trays for putting big size food items in the machine for more convenience while drying. The price on which the product offered is quite reasonable as per the features which you get in it. Mostly the appliances which comprise of the digital timer and distal thermostat function are costly to buy. But this machine has surpassed such false facts. It can be digital programmed up to 48 hours without an issue. That means if you want to go out for work then, just place the food on the trays and set the timer. Rest will be done automatically as the machine will shut down on its own as the time gets up. The instructions given in the instruction booklet which is provided by the manufacturer is apparent and understandable. It tells you that how you can prepare a particular dried food and in how much time. The size of the Andrew food dryer is suitable to get the place on the kitchen countertop. So, if you have a small family then, there is no issue to buy this food dryer for your home. It fits nicely in any place. The adjustable thermostat feature of the machine comes with the 5 degrees Celsius increment which let you control the unit effortlessly. This feature is not available on any other food dryer in the same price range. It comes with the transparent lid through which you can check the progress of your food in between the drying process quickly without disturbing the procedure. The machine in which the cover is not transparent, the user have to stop the dryer for checking the status of the dried food which is not right. This food dehydrator has a few components which you can’t clean in the dishwasher. But you can wash the lid, outer cover and the trays of the appliance with the hands for easy cleaning. The base of the dehydrator should be clean with the help of the wet cloth that dipped in the soapy water. In this machine, you can dry a variety of foods from fruits to vegetables and spices and herbs. All the foods get evenly dried along with the proper consistency. It dries the herbs in just two hours which is very quick. The wattage power capacity of the appliance is 550 watts which mean that running the unit for a longer period will not affect your monthly electricity bills at all. You can use it without worrying about your pocket. There is no need to rotate the trays of the machine while drying food in the Andrew James Food Dehydrator. The food on the trays get dry evenly without a problem, and you can do your daily work side by side. 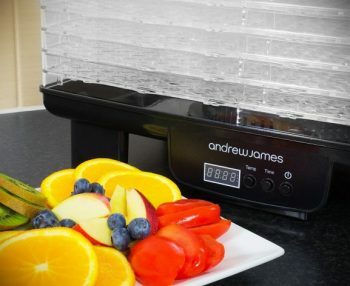 The Andrew James Food Dehydrator is not a dishwasher-safe appliance. Thus you have to clean it with your hands only which might little irritate for some people who have a busy life. The trays of the appliance are not BPA free which means that heating food on the trays can affect the health. Thus, if you want to buy a food dryer with BPA free trays then, look for other option in the market. It is not possible to select the correct temperature in the appliance. The temperature gets the increase with the 5 degrees C increment which does not let you choose the exact desired temperature. The stacking design of the appliance is not user-friendly. You have to take out all the trays every time which is very difficult sometimes. The buttons of the machine are pitched high which is not convenient to use every time. You might find it tough sometimes to use. There are no plastic inserts given along with the appliance which can stop the food from sticking on the trays. You have to buy the inserts additionally. The dehydrator does make some noise while cooking food in the machine. It is very irritating and annoying sometimes. So, you cannot use it at the night time when your family members are sleeping. Q: Can you tell me that how much expense will i have to bear while running the andrew james food dehydrator? This appliance runs on the 550 watts power which incurs the cost of which costs 3p an hour. It does not influence much in your monthly electricity bills. It also runs on the 2309 v power. Q: Does This Food Dryer Come with the Drying Trays or Not? The Andrew James food dehydrator comes with the six drying trays, but if you want to increase the drying space of the appliance, then you have to buy the additional shelves from the market. Q: Is It Mandatory to Buy the Dehydrator Sheets for This Appliance? It is not compulsory that you purchase the dehydrator sheets along with this dryer. But if you want to dry the liquid food items in it then, you must buy the dehydrator sheets for sure. It does not let the liquid to fall on the bottom section of the appliance. Q: Is It Possible to Make the Dried Chicken in the Andrew James Food Dehydrator? Yes, you can cut thin slices of the chicken and dry it in the machine for few hours. Q: How the Air Flows in the Dryer? It flows vertically on all the trays in this food dryer. Q: Does the Andrew James Food Dryer Make Some Noise While Drying Food in the Machine? Yes, the dehydrator does make some noise while making food in the unit. It is very irritating and annoying sometimes. So, you cannot use it at the night time when your family members are sleeping. 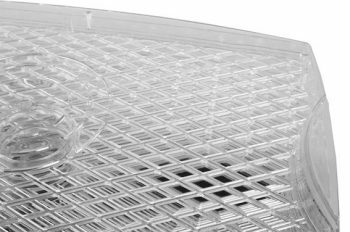 Q: Which Plastic Used for Manufacturing the Andrew James Food Dehydrator? The phthalate-free plastic used for making the Andrew James Food Dehydrator. Q: Does the Length of the Cord in the Food Dryer Is Long Enough so That I Can Move Quickly in My Kitchen? Yes, the size of the wire is 1.10 m. The length is quite long for moving the product quickly on the kitchen countertop. Q: What Are the Dimensions and Weight of the Andrew James Food Dehydrator? The dimensions of the product are 28 x 28 x 43 cm, and the weight of the machine is 4 kg which is quite enough to place the appliance on any size of the kitchen. Q: How Will Time It Takes to Dry Out the Food? It will take around 18 to 32 hours for drying the food easily in the machine. Q: Does It Come with a Digital Thermostat and Digital Timer? Yes, you will get a digital thermostat in this appliance which comprises of the drying temperatures range of 40 degrees C to 70 degrees C. You can set the range according to the type of dried food you want to dehydrate in it. It also has a 48 hours timer which you can use for setting the time. Q: Is It Possible to See the Progress of the Dried Food During the Dehydrating Process? Yes, it comes with a sees through lid through which you can check the progress of your food in between the drying process quickly without disturbing the procedure. The machine in which the cover is not transparent, the user have to stop the dryer for checking the status of the dried food which is not right. Q: Where Does the Fan of the Food Dehydrator Locate? The fan in this product located on the bottom section for the vertical flow of the air. In fact, the heating element of the appliance also located in the lower part. Q: Is It Possible to Expand the Drying Space of the Andrew James Food Dehydrator? Yes, you can increase the drying space of the appliance by adding more trays. Q: Do the Trays of the Product Are Removable to Place the Tall Items? Yes, you can remove the trays of the machine for putting the bulky and the tall items. Q: I Have a Query. after Drying Food in the Andrew James Food Dehydrator, I Have Tasted the Plastic Flavor in the Food. Why Does This Happen? If you are using the machine for the first time then, you can wipe it off with the wet cloth first and begin the use. It usually happens when you are using the food dryer for the first time. Q: Will I Get Any Manual Book along with the Andrew James Food Dehydrator? Yes, the food dehydrator complemented with an instruction manual which gives you the detailed explanation that how can you use the appliance in a better way. It also describes the safety precautions which you can follow while using the machine. It tells you the drying time which the food will take. Q: How Much Warranty Period Offered on This Machine? The manufacturer of the product offers a 2-year warranty period from the date of buying. So, in a case of any defect or problem the company will replace the product, but after the end of the warranty period, the company will not entertain any issues without any expenses which you have to bear. Q: How Will I Know That Andrew James Food Dehydrator Is a Safe Product to Use? The Andrew James food dehydrator has also got approval from the ROHS (Restriction of Hazardous Substances) and CE (Conformité Européene). It means this product easily used without the fear of any danger or safety. It has also got certification to get sold in Europe. It has passed all the safety standards by the official authorities of the department. Thus, you can safely use it for the longer period. Q: Can I Make Jerky in This Food Dryer Machine? Yes, you can dry jerky in this machine as it comes with the feature of an adjustable thermostat that allows you to set the high temperature also. Q: Is It Possible to Wash the Product in the Dishwasher? You need to clean the food dehydrator with your hands only as it is not a dishwasher product to use. You can clean the inside segment of the machine with the wet cloth that is dipped in the soapy water only. Q: Is This a BPA Free Product? No, it is not a BPA free product. If you want to buy a BPA free product, then look for other options. The Andrew James food dehydrator has a good number of trays which required for essential drying of the food. You can dry food in it in bulk quantity quickly. It does maintain the consistency and vibrancy of the food while drying the food evenly. This food dehydrator has all the hi-tech and innovative features (like a digital timer and digital thermostat) which you are looking to have in your food dryer. Besides this, it comes at such a reasonable price that can suit any person's budget. It is a lightweight machine also which you can move quickly from one place to another on your own. In the above article, we have reviewed the Andrew James food dehydrator thoroughly after doing proper research and study. Our primary aim is to provide and cover all the aspects of the appliance which you do not find on the shopping websites quickly. Overall, this product is excellent to buy, and it highly recommended to all those people who are looking for a budget-friendly food dryer for themselves. We hope that till now you have to make up your mind regarding the buying of the Andrew James food dehydrator and if not then, purchase this food dryer soon. If you have any query or doubt regarding the above article then, just write to us in below comment box. We will reply to you as soon as possible. However, if you have already bought this food dehydrator then, share your lovely thoughts with us. We will feel very obliged to read the views from our readers. Funny. That “review” seems more like an advert to me. Bit dishonest. Lured me in. I am fascinated to know whether this is a UK blog, American, or from somewhere else. I get the feeling that English is maybe not the reviewer’s first language! I also wondered whether the reviewer actually has an Andrew James dehydrator … I’m with Kevin: it all sounded a bit stilted. 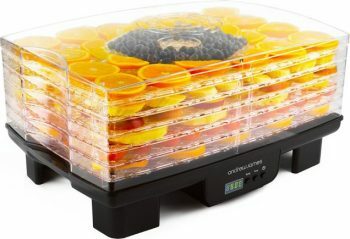 My wife and I do have one of these dehydrators and so far we are really pleased with it. We have made two different flavours of jerky, using organic flank steak (we also bought an Andrew James slicer, which is an invaluable companion to the dehydrator). We used the slicer to slice up a courgette that had become a giant marrow, flavoured the slices with all sorts of different flavours (including herbs from the garden that we dehydrated) and made marrow crisps. They are delicious (although we stopped before they became too crisp). We’ve also dehydrated some chillies and peppers from the greenhouse. The jerky is to die for: the only problem is to stop eating it all in one go! We are probably going to try pemmican next. It certainly means we will be making better use of herbs from our herb garden. And I’m keen to dry mushrooms to make Nom Nom paleo’s Umami powder. We have writers from different countries who cover on this blog. They usually do research about the product online and write a review about that product. In general, we don’t own any product we review on our blog. We just collect data or product information from the different sites and users feedback and write a review. Thanks for your feedback about Andrew James dehydrator. If I understood your question correctly, here are the few guides on dehydrating meat on our blog.